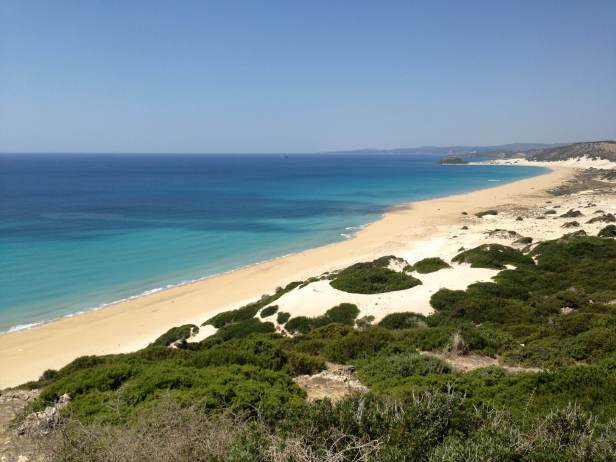 The 'must-see' beach on the south side of North Cyprus' Karpas Peninsula is Karpas Golden Beach, miles of golden sand backed with romantic sand dunes, and home to breeding sea turtles. No holiday to North Cyprus can be complete without a visit to the Karpaz Peninsula, this is the Cyprus of old, a land almost unspoilt by the savage hand of modern development, where Mother Nature still holds the reins of power; where donkeys, trees, flowers, and cereal crops dot the landscape as far as the eye can see, before tapering off into the blue waters of the Mediterranean. A few days are needed to see this part of Cyprus where time almost stands still. To rush through this peaceful, quiet land means to miss so much.There is also an abundance of history with ancient city sites, Byzantine period basilicas with intricate mosaics; conglomerations of timeworn churches; rural traditional Cypriot villages whose inhabitants pursue a way of life now as they have done for the past few hundred years. Here in an agricultural scene the story of Cyprus over the millennia unfolds. The traditional story of the monastery's founding says that, during a journey to the Holy Land, the ship transporting Saint Andrew went off course and struck rocks here. On coming ashore, Andrew hit the rocks with his staff, at which point a spring gushed forth. The waters proved to have healing powers and restored the sight of the ship's captain who had been blind in one eye. Thereafter, the site became a place of pilgrimage. A fortified monastery stood here in the 12th century, from which Isaac Comnenus negotiated his surrender to Richard the Lionheart. In the 15th century, a small chapel was built close to the shore. The church of the main monastery dates to the 18th century, while the main buildings are 100 years later. Mass pilgrimage, however, is only comparatively recent, dating back to the 20th century. The story is told that in 1895 the son of Maria Georgiou was kidnapped. Seventeen years later, Saint Andrew appeared to her in a dream, telling her to pray for her son's return at the monastery. Living in Anatolia, she embarked on the crossing to Cyprus on a very crowded boat. Telling her story during the journey, one of the passengers, a young Dervish priest became more and more interested. Asking if her son had any distinguishing marks, and on hearing of a pair of birthmarks, he stripped off his clothes to reveal the same marks, and mother and son were reunited. 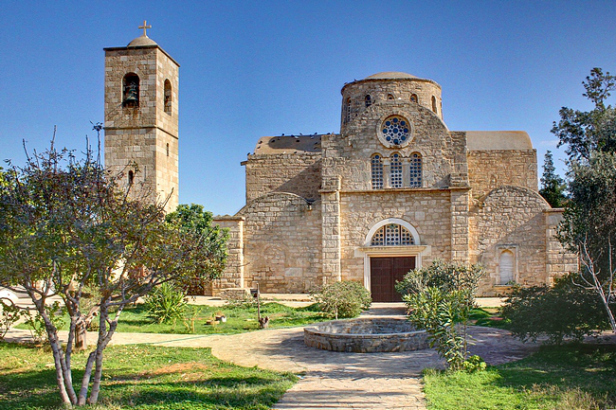 After the Turkish Invasion of Cyprus in 1974, very few pilgrims have visited the monastery, but with the opening of crossing points more pilgrims have come to see the monastery. The monastery has fallen into a state of disrepair in recent years, and UN funding is in place to pay for refurbishment. The church in the monastery was originally a Byzantine building, built on the site of an Aphrodite temple. It has been reconstructed at various times over the centuries, with most of the buildings dating to the 18th century when the large central dome was added. However, the side portals and columns of the nave survive from an earlier Gothic church built by the Lusignans. It is said that Mamas was a Christian saint from Anatolia who was killed on religious grounds. His family, aided by Jesus Christ, placed Mamas in a coffin and buried him at sea. The coffin, swept away by the tide, made its way to the Gulf of Morphou (now Guzelyurt), where it was found by a humble man who lived in the area. The man returned to his house and gathered two oxen and called for his four sons to accompany him to the place where the coffin had landed. Tying a rope to it, they tried to pull the coffin away. However, the man, realising the coffin was heavier than he had initially thought, called for help. The coffin was eventually taken with great difficulty and effort, and when the coffin could be carried no further, a church was built round it. Another legend has Mamas as a 12th century saint who lived in a cave near Guzelyurt. the Byzantine duke of the time demanded taxes from the local population. Mamas refused to pay the taxes as he lived in a cave. The Duke commanded two of his soldiers to arrest Mamas and bring him to Lefkosa. As the soldiers brought Mamas to the city to be punished, their paths were crossed by an aggressive lion which was ready to pounce on and tear apart a lamb. Mamas, witnessed by the terrified soldiers, saved the lamb from the lion's paws and continued the rest of the journey, entering the city on the back of the lion, carrying the lamb in his arms. On seeing this sight, the Byzantine authorities were so impressed that they decided to exempt him from paying taxes for the rest of his life. Since then, St mamas has been the patron saint of tax avoiders. is said that during the Ottoman rule, believing there was treasure hidden in the coffin, they bored holes into its side, at which a sort of nectar oozed out. This balm which appeared at irregular intervals was said to give protection against earache (as well as the ability to calm stormy seas). The icon section of the church dates back to the Lusignan and Venetian periods. On the four Venetian pillars are carved grape, fig and shield figures, as well as the Venetian coat of arms. The pulpit was built in 1711, and the oldest icon to around 1745. Outside the church, the monastery buildings are to the north and east, and records show them as being built in 1779. Architecturally, the arches on the front of the northern buildings are quite different to those on the eastern side. The northern buildings reflect the traditional style of the complex. On the eastern side, there is a resemblance in style to 18th century Ottoman inns, with stone columns on the ground floor and timber balconies on the second. The monastery buildings are now used for business purposes, ranging from lawyers to a television office. Pause for a while at the small coffee shop in the south eastern corner and and soak up the atmosphere. Admire the proprietor's match stick model of the mosque opposite, and you have a friend for life. On the 24th December, Greek Cypriot irregulars forcibly entered the house of Dr Ilhan, who was a Major in the Turkish army, and was on duty that night. The Doctor's wife, three children and a neighbour were killed by machine gun fire, and 6 neighbours were seriously injured. The house remains almost as it was found that Christmas. This is by far the most disturbing museum on the island. The inside of the bathroom where the murders took place was left intact, with captions explaining that the spots on the walls are the actual blood of the four victims. In the other rooms are photographs of other victims of ethnic violence over the years. One of the most important architectural works of the Ottoman period, the Buyuk Han (The Great Inn) is located in the traditional market centre within the City Walls. 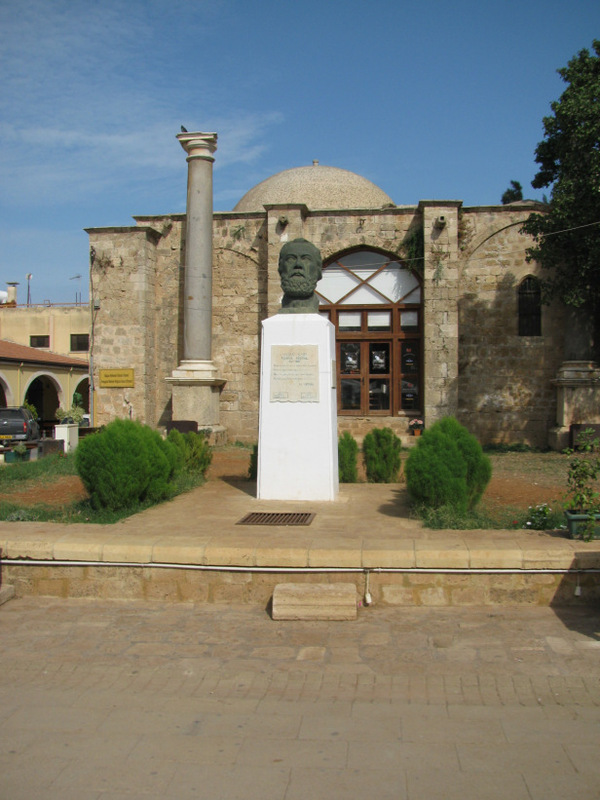 The Guzelyurt museum is situated in the former ecclesiastical residence adjacent to the Church of St. Mamas. There is a small car park and it is within walking distance of the town centre. 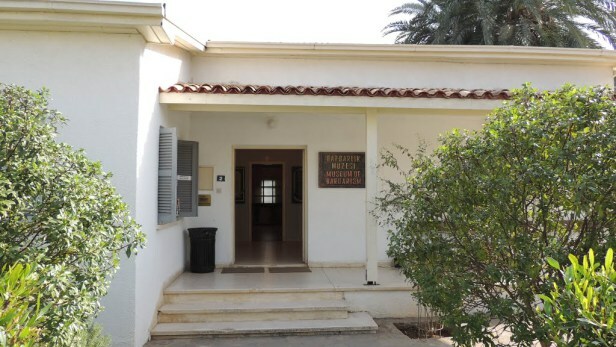 The Natural History section is on the ground floor and it contains a motley collection of specimens that ranges from samples of the rocks that comprise the island of Cyprus, through to snakes and lizards preserved in formaldehyde, stuffed birds, and strange aberrations of nature, that includes a two headed lamb. The upper floor contains the archaeological museum and is well laid out in a series of numbered rooms, with the artefacts in Room I, at the start of the exhibition, dating from the Stone Age. One of the rooms is almost exclusively dedicated to the artefacts found at the Bronze Age site of Toumba tou Skoura* and in Room V there are some exquisite pieces of gold jewellery. Not to be missed is the “Golden Treasure of Soli”, a fabulous hoard of bracelets, rings, necklaces and a gold wreath found in 2005 by the water department, in a drain behind the theatre at Soli. Comprising work that is so fine it looks as if it is a recent creation by a master-craftsman using the latest tools and technology, yet it dates from the Classical and Hellenistic period 5th to 4th C BC. The display also contains photographs of the serendipitous discovery. In the 1970's, with the decline of Beirut as a holiday destination, Varosha stepped in. 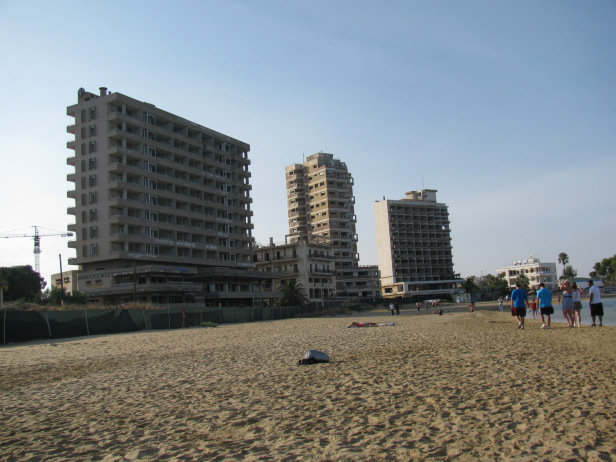 Many new high rise building were constructed to cater for the increasing number of tourists, and by 1974, Famagusta, and in particular the suburb of Varosha had become the number one (almost the only) tourist destination on the island. In 1974 Turkish Cypriots from the surrounding areas had sought refuge inside the walled city. Greek Cypriots, on the other hand, mainly congregated in the Varosha area of the town. As the Turkish forces approached, most of the population of Varosha, around 40,000, fled to the south. Thinking they would be back within days, most of them left all their possessions behind. After the cease fire, Varosha was made part of the UN buffer zone, although it is still controlled by the Turkish military. There are, however, various areas where the view into the restricted area is quite good. Since 1974, the town has remained untouched. Weeds have taken over the streets, the buildings are gradually crumbling, and the beach is deserted. The building of the church started around 1300, though it is thought to be on the remains of an earlier church. If you look closely, you can still see damage caused by the Ottoman bombardment. 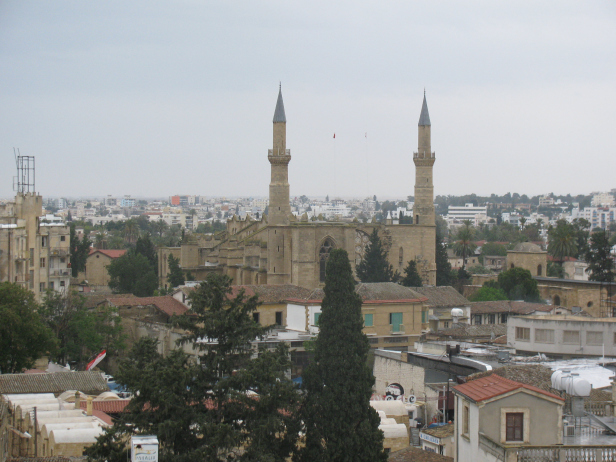 After the fall of Famagusta, a minaret was added to the northern tower, and the church converted into a mosque. There are three entrances at the western end, and above each of them is a plinth, which is assumed to be for a statue, although there are no records to prove this. Above the main door is a large round window with decorative tracery. This is a common feature of church buildings of the time, and is commonly known as a rose window. Outside the entrance, the old tree that you can see is a fig-mulberry. It is reputedly the oldest tree in Cyprus, having been planted around the same time that the cathedral was built. 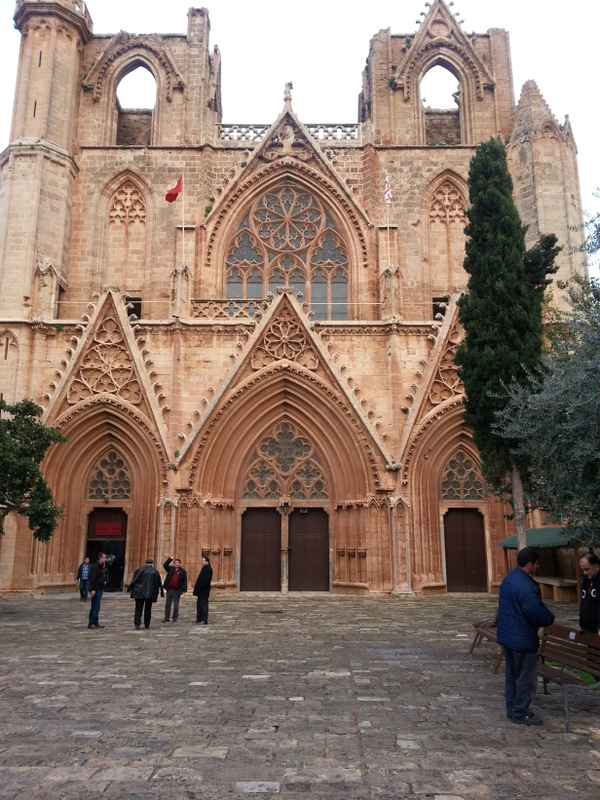 After the fall of Jerusalem in 1291, the Lusignan kings, after having been crowned king of Cyprus, came to this cathedral to be crowned king of Jerusalem. It was also here that the last Lusignan ruler, Caterina Cornaro yielded to the pressure of the Venetians and abdicated. Inside the mosque, in accordance with Muslim practice, all images of the human form were removed, and any frescos on the walls were covered with plaster, and who knows what treasures remain hidden underneath. The Ottoman leader, Lala Mustafa destroyed the alters and statues to the saints. Stained glass was replaced by clear glass, if replaced at all. He removed gravestones, and even human remains were removed, including thos of the last two Lusignan kings of Cyprus. As in all mosques, the floor of the church was covered by a carpet, so there is a possibility that some gravestones remain. One, however, can still be seen. In the north west corner, is the tomb of the Bishop of Famagusta, who is depicted holding his pastoral staff. He was ordained in 1360, and died in 1365 from a chill received while swimming in the sea. The apse, now without an alter, is topped by a form of corona, representing not just the crown of Christ as king of heaven, but also the crown of the Lusignan kings of Jerusalem. The Ottomans renamed the cathedral the St Sophia mosque of Gazimagusa (not to be confused with the St Sophia mosque of Nicosia). 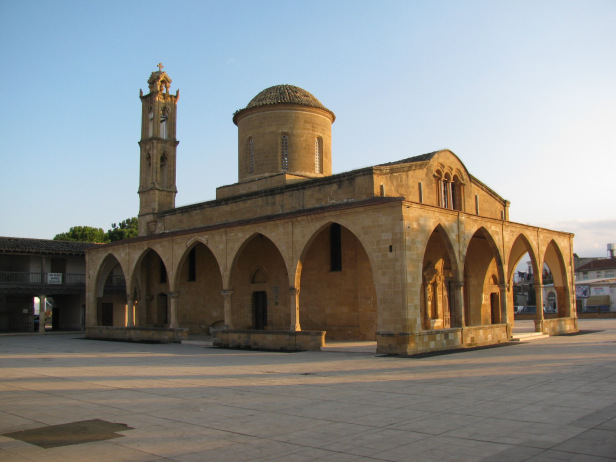 The name continued in use until 1954, when, like its sister in Nicosia, the mosque was renamed, and is know known as the Lala Mustafa Pasha mosque. Lala Mustafa Pasha was born in the Ottoman province of Bosnia, at the village of Sokolovic, and brought to the royal palace during the reign of Selim I. he was promoted to the prestigious position of chief caretaker of the imperial stables by Suleyman the Magnificent in 1555. He became a vizier (a high-ranking political advisor) to Sultan Selim II, who appointed him as commander-in-chief of the Ottoman forces for Cyprus. He died in 1580. A number of myths have grown up round Pavlides. What is known is that he came from a respected family involved in the motor trade. He was the main agent for General Motors, Vauxhall and Opel, with offices in Famagusta, Larnaca, Paphos and Kyrenia. What is rumoured (but without any proof), is that he was an EOKA gun runner who built his house where he did in order to keep an eye out to sea for the arrival of his gun-running ships. There are also rumoured to be secret underground passages and chambers built to hide contraband and smuggled arms. Whatever the truth, Pavlides was no doubt an eccentric, flamboyant man who tended to build his houses in remote areas to ensure his privacy. Having fled what became a Turkish Cypriot area to the Greek Cypriot area of Morphou (Guzelyurt), he built the Blue House in a similar style, but with a blue theme. There are blue tables and chairs, a blue bathroom and a blue sunken fountain in the sitting room, among other other blue-themed features. The views from the upstairs rooms are spectacular, and whatever reason he had, you can appreciate Pavlides' reason for choosing such a location. In 1974 Pavlides had to flee once again (supposedly through an escape hatch in the roof of the main bedroom) when the Turkish army took control of his hilltop retreat. The house was used as a residence for a Turkish general until recently, when it was vacated and turned into a museum. Any hope Pavlides may have had that he would regain his property disappeared with the partition of the Island, and he died (depending on who's story you listen to) either broken hearted and disillusioned, or shot dead by a Turk in Italy in 1986. Namik Kemal (1840-1888), a distinguished nationalist poet and novelist, spent his thirty-eight months in this dungeon when he was sent into exile by the Ottoman Sultan on April 9th 1873 soon after the first performance of his play 'Vatan or Silistre' at Gedik Pasha Theatre in Istanbul on April 1, 1873. The ground floor, with only one vaulted cell is in the shape of a rectangle and it has low arched entrance door which opens on to the courtyard of the Venetian Palace as well as the two windows in the same wall. 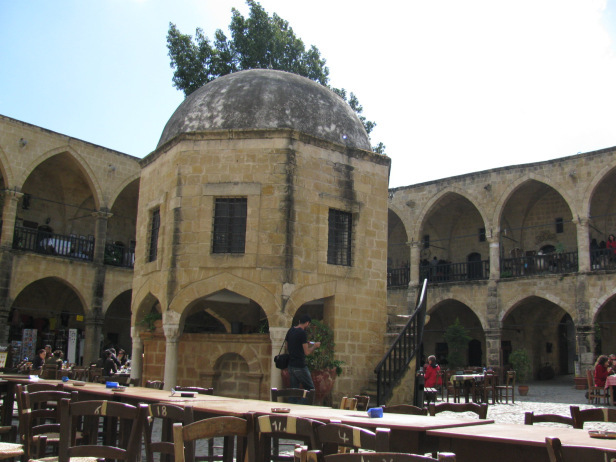 When Namik Kemal came to Famagusta, he first stayed at the ground floor, but after a while he was taken to the second storey with the permission of the Cyprus Governor, Veysi Pasa. The steep stone stairs at the side of the building take you to the rectangular second storey which has two large windows, a landing in the front, a marble floor and a timbered ceiling. After having been forgiven by Murat V. on June 3rd 1876, Namik Kemal returned to Istanbul on June 29th 1876. Restoration of the Namik Kemal Dungeon and Museum was started at the beginning of 1993 and completed it within a short period of six months. Organization of the museum was made with the collaboration of the Ministry of Education and Culture. 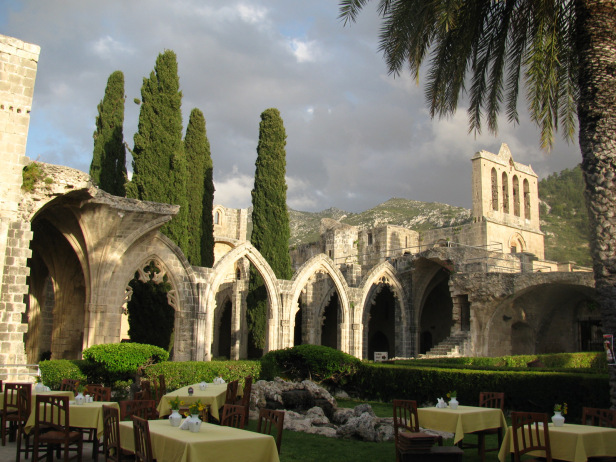 To the north-east of Kyrenia, set on the side of a mountain, this twelfth-century monastery is a fine example of Gothic architecture of the Lusignan period. The area around Famagusta has always been favourable to growth and prosperity. There was a large fertile plain and a natural harbour. In addition, the prevailing winds and ocean currents mad it in ideal position for trade with the near east. Salamis, itself, was reputedly founded by Teucer, son of King Telamon of Salamis island. It is thought that the city was originally restricted to a small area round the harbour, and gradually expanded, particularly from around 1100BC, when Enkomi was abandoned and its inhabitants moved to Salamis. By the 8th Century BC, Salamis had become an important trading centre and a Royal city. Until the end of the fourth century it ruled over a tract of country far more extensive and fertile than that possessed by any other town, at one stage reaching as far as Troodos. The first coins had been minted in Salamis in the 6th century BC, and in inscriptions throughout the island from around this time, Salamis is mentioned. At this time, Salamis was part of the Persian Empire, which lasted till the march of Alexander the Great into Asia Minor. However his early death resulted in the empire being split, with Cyprus falling to Ptolomy, and the fortunes of Salamis began to wane. During the Helenistic and Roman periods, Salamis again became an important trading centre with the countries bordering the Mediterranean. 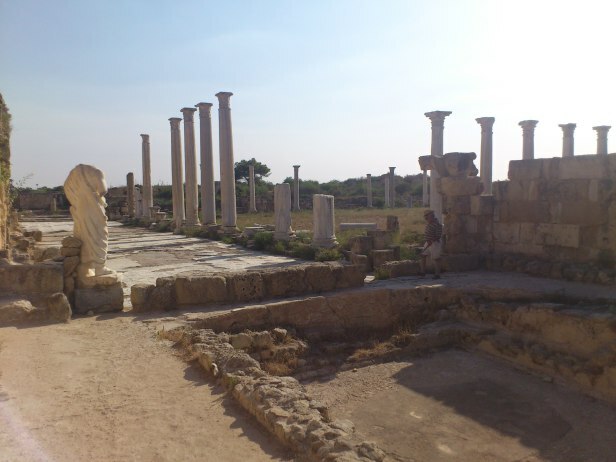 Although Paphos was the official capital of the island, Salamis was the most important commercial city. Most of the excavations at Salamis date from this time. In AD 46 Paul and Barnabas, a native of Salamis, travelled to Paphos where they revealed the gospel to the Roman governor Sergius Paulus. He was converted, and thus became the world's first Christian ruler. Barnabas later preached in Salamis where he was eventually martyred by the Jews. The mission of Paul and Barnabas was to have far reaching implications, enabling the church in later years to demonstrate its apostolic origin and justifying its claim to be independent of the patriarch of Antioch. After their revolt was crushed in Jerusalem in AD 70 by the Romans, many Jews settled in Cyprus, particularly in Salamis. Here in AD 115, they rebelled again, and the ensuing carnage over the next two years prompted the decree from Rome expelling all Jews from the island. Earthquakes in 332 and 342 caused a great deal of damage, and the city was rebuilt by the Byzantine emperor Constantius, naming it Constantia after himself, making it the capital of the island once again. The city became the seat of both the Byzantine governor, and the Orthodox archbishop. By this time, however the harbour was beginning to silt up, and the city was subject to Arab raids. In 648, after yet another Arab raid, the citizens moved to Arsinoe, which later became Famagusta, although there is some evidence of occupation as late as 1300. For many years, the city was treated as a source of building materials, and during the Venetian period, many columns and pieces of sculpture were removed from the site. Shifting sands, however, covered most of the city and protected it from the hands of looters. Some small scale excavation was undertaken in 1887, but it was not until 1952 that the site was excavated to any great extent, and these excavations continued till 1974, when international funding and expertise was blocked by the authorities in south Cyprus, who tell the world that any archaeological excavation in the north is both illegal and vandalism. The centre of Salamis during the Roman period was to the north of the city, where the present entrance is located. Excavations so far include the gymnasium and theatre, which have been extensively renovated. The theatre is frequently used for concerts. Away from the Roman area, the temple of Zeus Salaminos has been discovered. It is thought that this dates back to the founding of the city. From Byzantine times, there are the remains of the Basilica of St Epiphanios and the Kampanopetra Basilica, both dating to around the 4th century. In spite of protests from the south, however, in 1998 excavations restarted. In 2000, some Roman baths were uncovered. In 2002, the archaeologists unearthed the north/south axis road of Salamis, which has been named the Pillared Road. At the northern end of this road, was a hill, and excavations here discovered that under it was an intersection with a gate. From here, one road leads to the baths of 2000, while the other leads to the gymnasium and amphitheatre. In 2003 work was done on the southern part of the road. This lead to a part of the site where it is believed there was a residential area of the ancient city. It is thought that the road which has been discovered is the main road connecting the residential area with the public areas of the city. So far, nearly 300 meters of the road have been uncovered, but it appears that many of the stones used to pave the road were later removed to construct the city walls built in a later era to protect the city. Another important discovery made at this time, and located closer to the amphitheatre, was a chapel believed to have been constructed in the late 6th century. Currently only surveying work and cleaning the area is being undertaken, but it is hoped that more excavation can be undertaken in the near future. Although 90% of the city remains buried under the sands, the site is still impressive, and well worth a visit. The Selimiye mosque, originally the Roman Catholic cathedral of Ayia Sofia, is the oldest, and one of the finest examples of Gothic art in Cyprus, the work of the French masons who accompanied the Crusades. The monumental main door and the carved stone window above it are of particular interest. Construction began in 1209 during the reign of the Lusignan king Henry I, and lasted 150 years. There is evidence that it was built over the ruins of a much earlier Byzantine church called Hagia Sophia. It was consecrated in 1326 while still incomplete, and the blunt-roofed bell towers were never finished. Within its portals, Lusignan princes were crowned kings of Cyprus before proceeding to Famagusta for a second, essentially honorary, coronation as king of Jerusalem. The cathedral was restored by the Genoese in 1373 and the Mamluks in 1426. The eastern section of the cathedral was destroyed by earthquakes in 1491, and further restoration work was undertaken by the Venetians. When the Ottomans took the city in 1570, they destroyed the interior fittings, chopping up the pulpit and pews for firewood, and using the tombstones for flooring. Unfortunately, the more interesting tombstones are not usually visible as the floor is now covered with a large carpet. A pair of fifty metre high minarets were added to the incomplete bell towers, and an ablutions courtyard fountain with trefoil arched niches was constructed. As a mosque, the church was renamed the Hagia Sophia Mosque, a name which it retained till 1954 when it was renamed the Selimiye Mosque. As well as being the most beautiful mosque in Nicosia, the Selimiye Mosque is also the biggest and most attended of all. Since the mosque still serves as a house of worship, there are no set visiting times. Try to coincide with the five prayer times, when you are allowed in shoeless, modestly dressed and silent. In recent years, the old streets around the mosques have been renovated. Consequently with the addition of thriving businesses such as authentic restaurants and antique shops, the area around Selimiye Mosque has reached a new level of liveliness, and has become a popular destination among tourists as well as locals, both during the day and night. Live music by local performers and bands are likely to take place several nights a week in certain venues in the vicinity of the elegant mosque. At 732m, St Hilarion is at the middle height of the three. It is, however by far the best preserved. The walls and towers appear to sprout off the rocks almost at random, giving the castle a fairy tale look. Indeed it is said to have inspired Walt Disney to use it as a design for the castle in Snow White and the Seven Dwarfs. 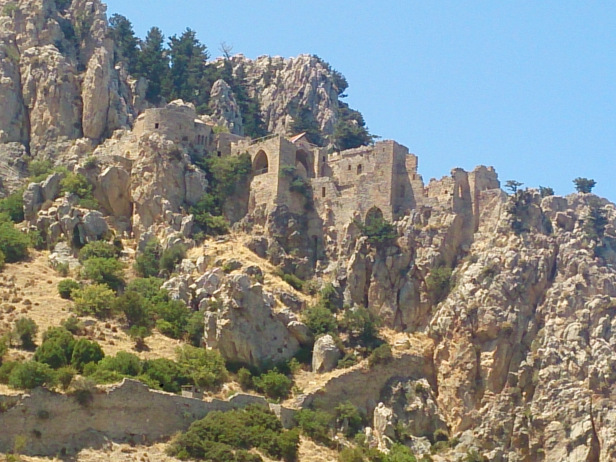 Owing to its near impregnability, St Hilarion was one of the last castles taken by the crusaders in 1191. The fortifications were improved by the Lusignans during the early 13th century, and the castle was the focus of a four year struggle with the Holy roman Emperor Frederick II for control of the island till he was defeated in 1232. Over the next 140 years, sumptuous royal apartments were added so that the castle became a summer residence. It also served as a place of escape in 1349 when the Black Death swept the island, and estimated numbers of the dead range from one quarter to one half of the entire population. In 1373, during the Genoese invasion, the castle again became militarily important as the retreat of the under-age King Peter II. His uncle and regent, John of Antioch, mislead by his hostile sister-in-law into believing his bodyguard of Bulgarian mercenaries were treasonous, had them thrown one at a time from the highest tower of the castle. 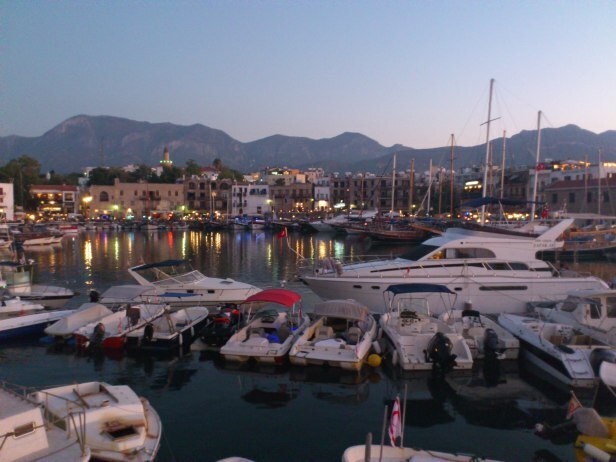 Without his protection, John, who had been implicated in the murder of Eleanor's husband, was lured to supper with Eleanor in Nicosia where he was, in turn, promptly dispatched. 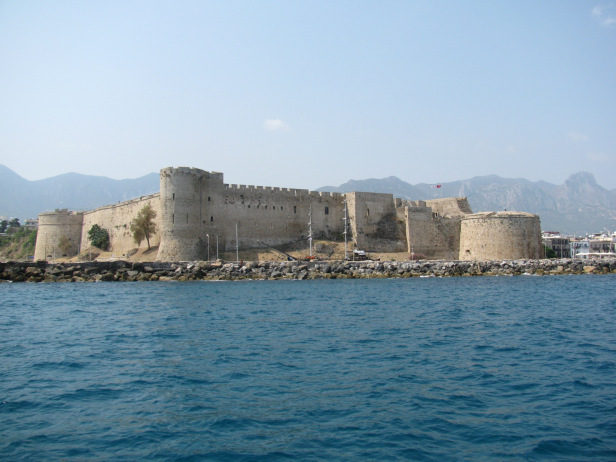 When the Venetians took over in 1489, they relied on Kyrenia, Nicosia and Famagusta for the defence of the island, and they abandoned St Hilarion and her two sister castles. Although the Venetians considered the castle obsolete, it came to prominence again in 1964, when the beleaguered Turkish Cypriots used it as the headquarters of their main enclave which included several Turkish Cypriot communities straddling the main Kyrenia Nicosia road. 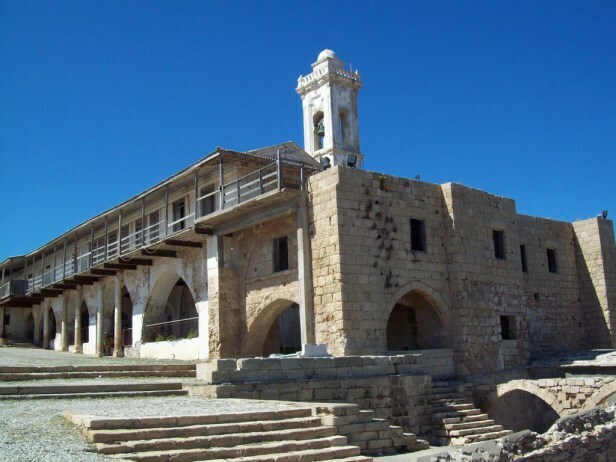 A small garrison of teenage activists was able to fend off EOKA attacks on the castle, and the Turkish Cypriots remained in control thereafter. The castle again played its part in 1974 when it was at the centre of a battle for control of this important pass between north and south Cyprus. Although St Hilarion is now very much open to the public, the approach road passes through a military area, so is very occasionally closed for access. The richest and most popular part of the castle is the elegant gallery with its two fantastic gothic windows, one with stone window seats intact. This is where queen Eleanor surveyed her kingdom, and is known as the Queen's Window. If you can manage a further climb up the uneven steps to the southern peak, you will be further rewarded with more superb views. Off the main courtyard, you will find the 14th century Prince John's tower standing on a rocky promontory. It was here that Prince John's bodyguard are reputed to have met their end. While he was in Jerusalem he was appointed Archbishop of Salamis, and in 45AD he returned to Cyprus, accompanied by his cousin and follower John Mark, and by Paul of Tarsus. The plan was to convert the sizable Jewish community to Christianity. Although he did not have a great deal of success, he managed to impress the Roman governor of the island, Sergius Paulus, to such an extent that he adopted the faith. Cyprus, therefore, became the first country in the world with a Christian ruler. During a second visit to he island in 75AD, Barnabas was arrested and imprisoned in a Salamis synagogue. The same night, a mob of Syrians stoned him to death. His remains were wrapped in a sheet and hidden in some marshland, prior to being disposed at sea. However, John Mark and some converted slaves from the local temple retrieved Barnabas' remains. They secretly buried them in a tomb beneath a carob tree to the west of Salamis, John Mark placing a copy of Mathew's Gospel on his cousin's chest. Hotly pursued by the Jews, who had discovered their plan, they escaped to Nicosia, where they managed to elude their pursuers and escaped to Egypt. The suppression of Christianity in Cyprus continued, and the tomb of St Barnabas was forgotten. By the 5th century AD, however, the Christian church had been re-established. The church of Antioch, having been founded by Peter, claimed precedence over that of Cyprus. The church on the island argued that as it had been founded by the Apostle Barnabas, it was of equal rank. In 477AD, Bishop Anthemios had a dream in which he saw the location of the long lost grave. After his dream, the Bishop ordered the opening of the tomb. There they found a body, which was identified as Barnabas by the Gospel of St Mathew lying on his chest. Post haste, the bishop set off to Constantinople (now Istanbul) to present the bible to the Byzantine emperor, Zeno. Delighted by this gift, the emperor granted autonomy (independence) to the church in Cyprus. To this day, Cypriot bishops have the right to elect their own archbishop who is entitled to wear imperial purple and wield a sceptre instead of a pastoral staff. In addition, in imitation of the Byzantine emperor's custom, they are allowed to sign documents in red ink, a right which Archbishop Makarios exercised when signing the document granting Cyprus independence form Britain. In addition to granting independence, the emperor funded the building of a magnificent church on the spot where the tomb was located. It was badly damaged during the Arab raids in the 7th century, and all that remains today are some foundations. Over the years, the number of resident monks reduced, and by the 1950s consisted of just three monks, Charitan (born 1887), Stephanos (born 1894), and Barnabas (born 1897). These three actual brothers dedicated themselves to the church from 1917 onwards. They took care of its upkeep, even building the bell tower in 1958. Most of their time was spent painting many of the frescoes and icons that are now on display. After 1974, the monastery and church stayed open, and religious ceremonies were held there, as the three brothers had stayed on. However, by 1976, old age and illness was taking its toll, and they decided to retire to the south. About 100 yards from the monastery, there is a small mausoleum built on the spot where the saint's remains were discovered. There are 14 steps which take you down to the cave under the building where the body of St Barnabas was hidden by his friends. The tomb was renovated (which included building the steps) in 1953. Although the three priests left in 1976, the monastery was maintained, as it continued to attract visitors. In 1991, a restoration project was started. The church has been restored and has been turned into a more comprehensive icon museum with the addition of new icons. The garden was redone, and the rooms of the monastery have become an archaeological museum. The monastery of St Barnabas is very important to the Orthodox Church, and is considered a place of pilgrimage. The opening of the border has seen a vast increase of the numbers of visitors to the site, and there are frequent church services held there. June 11th is the saint's day, and a special mass and festival was held here till 1974. People would come to the monastery to hear readings from the life of the saint. After a gap of 31 years, this event was reinstated in 2005.